The Oxbow Wetland Biodiversity Corridor project is receiving a much needed boost thanks to a State Government grant. B4C was successful in receiving conservation funding under Round One of the Community Sustainability Action grant program. This is great news – positive and practical environmental outcomes! The Bulimba Creek Oxbow contains areas of high ecological significance. We’ve provided a summary of the project’s goals and actions below. 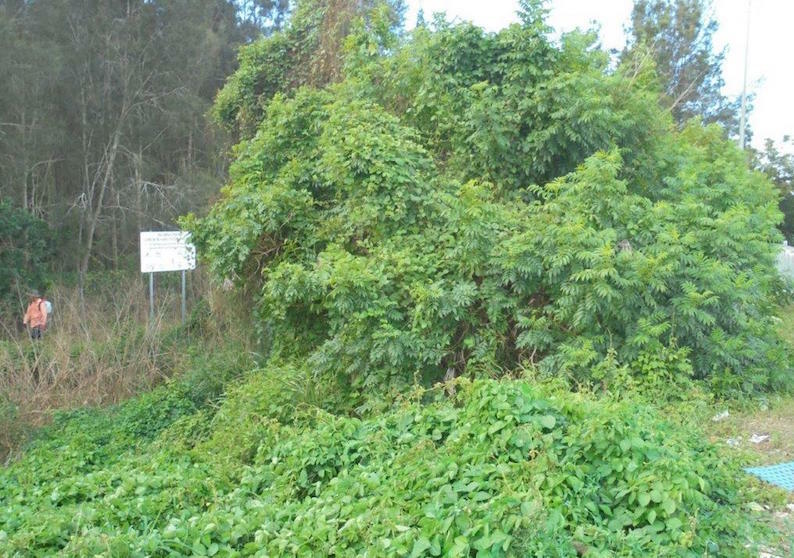 Remove a substantial biomass of exotic vines, woody-weeds and Lantana camara from embankment to decrease fire risk on environmental land adjoining the Port of Brisbane Motorway. Remove weeds and built up rubbish in roadside drainage channel and embankment. Provide an important vegetated corridor for wildlife refuge and movement across a large distance and linking vegetated communities from east to west. Provide a range of fauna nest-boxes to a site that has only regenerated since 2001 (no hollow-bearing trees). European Red Fox predating on native fauna – swamp wallaby, bandicoot, possums, reptiles. Weed infestation on embankment. It has smothered trees and has not been systematically managed, because of lack of funding. It is an infestation with some dead trees under, and little native vegetation surviving. Impacts from Port Motorway to wetlands including potential hydrocarbon runoff and sediment; rubbish accumulation in base drainage channel, from Motorway; poor visual amenity – both sides. Noise and light impacts on wildlife. Lack of connectivity for fauna movement and lack of flora diversity. Lack of nest sites for native fauna. Site has only been revegetated since 2001. We require a professional contractor to install and we can monitor. This is a specialised service. Fox controls – foxes are present and wildlife is impacted. A professional contractor is required due to highly specialised requirements, including WH&S. Intensive treatment of exotic vines and woody weeds over an initial “preparation” phase. Remove any fire risks and built-up dead plant biomass (which poses any risk to fire). 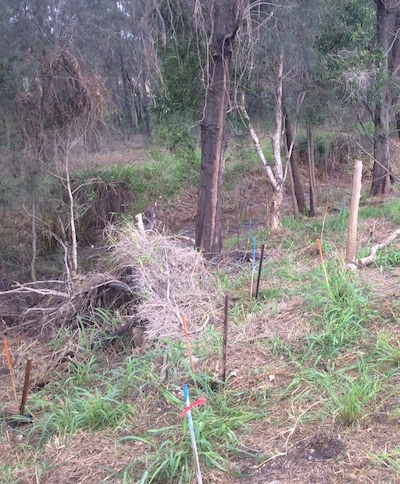 Revegetation with 600 native species (Fire-retardant species dominant); filtering species for potential pollution loads and sediment (an embankment). Wetland grasses – roadside channel. Systematic removal of regenerating weeds and polluting rubbish over the 12 month period. Install 10 nest boxes for a range of species. Monitor and maintain nest boxes over the initial 12 month grant period and beyond. Upload data from monitoring sessions onto The Atlas of Living Australia for public record. Professional Pest Animal Management Contractor to set up European Red Fox soft-pad leg traps and monitoring pads at locations over Oxbow. This will assist in on-going research. Set up safe access points to embankment and take care with upgraded workplace health and safety requirements (consistent with landholder requirements). Use of Bioactive Soil conditioning on all revegetation. We have several positive research sites currently under revegetation in our catchment. It is a new revegetation innovation. 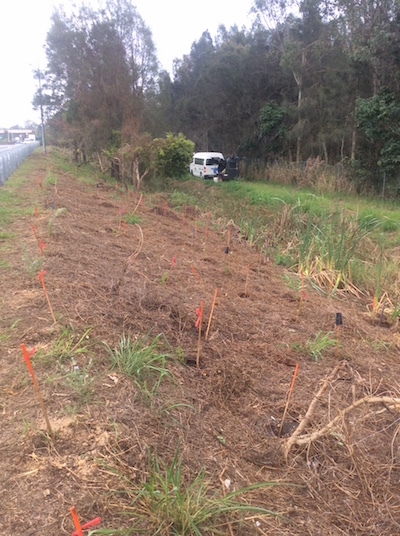 Enhancing the critical Bulimba Creek corridor through removing weeds and replacing with native vegetation. Weed controls will decrease the impact on the 30ha site and beyond. Improving habitat conditions and allow safe fauna movement. Diminishing potential fires from roadside impacts and standing dead trees (under vines). Increasing ecosystem diversity by reintroduction of suitable flora for habitat. Providing nest-boxes for trees with no hollows. Reducing feral predation on colonising native fauna by professional fox control. Providing a visual, pollution-control buffer from major motorway to Ramsar wetlands. Before: glycine (weed) at the Oxbow shortly before its removal. The Queensland Government’s Community Sustainability Action grants are being provided over three years to eligible individuals and community groups for innovative projects which seek to address climate change and conserve Queensland’s natural and built environment. The Community Sustainability Action grants are being delivered through regular targeted rounds. This round focuses on sustainability and environmental activities which will contribute to community action on climate change in Queensland. We look forward to providing more updates and photos from this project.